On Thursday, June 16, LNS Research hosted a webinar, "Quality Management in the Boardroom: Building the Executive Business Case for EQMS." The presentation focused on giving quality leaders a roadmap to a common issue we find in our conversations with many organizations: they often lack the framework for elevating quality management to the executive level concern it really needs to reach to transform from a cost center to a value center, and transform quality management maturity. The webinar focused on how to develop these frameworks, how to communicate them to the C-suite, and how organizations that follow best practices around quality find themselves performing considerably better in key quality metrics and exhibit higher levels of quality management maturity in their companies. Unfortuately, we didn't leave too much time for questions this go-around, so below I'll address a few of the questions that rolled in during the presentation. For those that were unable to attend the live event, the free, On-Demand recording can be viewed here. Q. Would you say ISO Major Audit or Customer Audit findings are 3rd party events? A. They are 3rd party events, and therefore uncontrollable. An audit finding can drive a business case, but in general will be insufficient to drive executive sponsorship on their own. However, if they are important enough to drive executive attention, they can be used both as a compelling event and as a way to broaden executive visibility to quality. One possible strategy to accomplish this would be to build your Master Business Case for Quality Management and use the audit finding as a way to drive a top executive discussion about the value of quality. Q. How would you leverage the required transition from ISO 9001:2008 to 9001:2015 as a compelling event? A. Great question. The required transition to ISO 9001:2015 can be a compelling event. It has a fixed timeline - the transition must be completed by September 2018 - and it can be a business driver - ISO-certification can be a purchasing consideration in contracts. Also, 9001:2015 shares language with ISO 14001 regarding more active involvement in quality from executive leadership as well as engagement with quality when setting corporate strategy. Finally, it also requires changes to cross-functional quality engagement, such as risk-based thinking. Carefully positioned, this compelling event can gain executive sponsorship for quality. 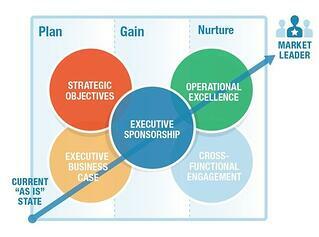 Remember, executive sponsorship must be our objective if we are to increase quality maturity. Use the elements of the ISO 9001:2015 update and the 6 Steps we laid out in the research to reposition quality with executive sponsors. - Build a Master Business Case focused on attaining market leader quality maturity. Make sure that this Master Business Case is focused on strategic objectives - the objective most likely cannot be simply the ISO transition, although the ISO transition should be one of the stated objectives. Also, make sure that the scope of the Master Business Case is corporate-wide. Then use the data we've provided to support the value of these changes. - Assess your existing Operational Excellence and determine your existing maturity level. - Support the Master Business Case with incremental investments that improve quality maturity and advance the quality business case journey. These investments will obviously address the ISO 9001:2015 changes, but also consider other incremental investments as suggested by the research. - When positioning, it is often beneficial to create a tag line - an initiative name - that is broadly appealing, but captures quality's support of strategic initiatives - use the strategic initiatives to help shape this ("Lead through Quality," "Customer First," etc). - Also, finding a mentor that has successfully positioned initiatives with the executive team can help make you gain support. Mentors can often provide lessons learned from your corporate culture and help you avoid potential landmines. Q. You brought up executive sponsorship for quality. Our culture is really different than that here. Other groups see us as the preventers of quality issues. I’m not sure that its possible to change that. A. This is exactly the Catch-22 we are discussing and it’s one reason we’ve done the research. You’re in a pretty common situation, and this research is a great tool to change the perception of quality's relevance to business. When you take this message, it can be beneficial to convey it through a champion or with the assistance of an executive champion. Q. There seem to be a lot of data points you analyzed, but I don’t see much of the data published in this presentation. How do I get to the other data? A. We wanted to provide some initial data points associated with leading process and technology differentiators. However, we’ll be publishing more detailed data over the coming weeks, and would encourage you to continue to come back for more content. Because you’re registered for this webcast, you’ll be able to access the upcoming content for a period of time. We can always talk with you here about your specific situation as well. Q. This Business Case Journey seems useful, but how do I pick the smaller investments? A. Right – the incremental investments need careful consideration. These are how we nurture our executive sponsors - through quick and meaningful demonstrated success. Every time I’ve been engaged with a company, there are usually a number of items that are low hanging fruit – good problems to solve that are important to the company, have fairly simple fixes, and drive value. You can find them with some of the best practices we track, and seeing if you have those best practices in your company. The advantage to that approach is that we’ve calculated the value of those best practices. Conversely, you can work with the other functions at your company to find those opportunities – and realistically you need to engage them as you need to increase in maturity and go cross-functional. No matter what you do, look for quick wins. Don’t go too big all at once – scope creep is a leading cause of project failure. Keep it simple, make sure that you can deliver results, and whatever you do use this opportunity to build cross-departmental momentum. For instance, deploying a risk management program that addresses 99.9% of all possible use cases but is very hard to use will set you back. Go for the long haul – demonstrate progress and grow. Q. Our company does a good job communicating our strategy, but it just doesn’t seem to be something that quality can help with. What should we do? A. Quality is front and center for many companies because of the Internet of Things (IoT). If you have an IoT program, dig into it. These strategies will often have titles that include Digital Transformation, Smart, Connected Assets/Devices/Operations, "Internet (Industrial) of Things/Everything", digital fabric or mesh, etc. Our data shows that Quality is a leading use case for IoT programs, and quality data is the top type of data being collected in IoT programs. Be sure to capitalize on this. If you don’t have this, then its useful to use the quality business case journey. Find out how your company is measuring success of its core strategy and look at your justification metrics, then back track to how quality enables performance in these metrics using our research data. Quality leaders, access the On-Demand webcast now! This webcast provides senior leaders with best practices for building a business case around quality and the foundational framework needed to gain executive commitment.